Art Parcours is a sector of the international art fair Art Basel that presents site-specific artworks and performances in Basel. For Art Basel 2012, the St. Johann neighborhood was chosen to be discovered via art. 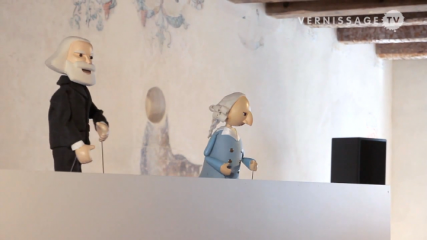 For his participation in Art Parcours 2012, the Mexican artist Pedro Reyes decided to enliven his ongoing video installation Baby Marx (2008 – present) into a live puppet show. The original work is a growing video production based on the nineteenth century debate between socialism and capitalism featuring Karl Marx and Adam Smith as the main characters in a puppet show directed at children. In the hypothetical debate Marx and Smith express their differing political ideologies in an articulate way. They discuss topics ranging from Occupy Wall Street to Warhol and explain how to get rich. Pedro Reyes was born in 1972 in Mexico City. The artist lives and works in Mexico City. Pedro Reyes’ work ranges from sculpture and film to design and pedagogy. His work revolves around social and political problems and proposes creative solutions. Art Parcours 2012 has been curated by Jens Hoffmann, Director of the CCA Wattis Institute in San Francisco. The above video is an excerpt, in which Adam Smith explains how to get rich. The entire show is available after the jump. Pedro Reyes: Baby Marx (2008 – present). Art 43 Basel, Art Parcours. Galeria Luisa Strina, Sao Paulo in collaboration with Alumnos 47. June 13, 2012. PS: See also: Pedro Reyes: Rompecabezas. Solo Exhibition at LABOR Gallery, Mexico City.